Our paternity testing lab will help you prove the paternity of your child with a court admissible paternity test that can be used in any court in the United States. Everyone inherits DNA from their biological parents. DNA paternity testing scientifically compares the child's DNA with that of the alleged biological father and, in most cases, the mother as well (at no additional cost) to determine completely valid paternity test results. 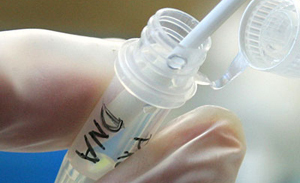 The documents for any DNA test, including tests for paternity, are carefully handled according to established Chain of Custody laws. Transmetron is a full-service paternity test collection lab & paternity testing facility. Paternity test results can be court admissible if all requirements are met. The method of testing is the non-invasive buccal swab, as with all other DNA Testing services we offer. No appointment necessary for paternity testing & walk-ins are welcome. Individuals who will test for paternity can arrive together or at separate times for more convenience. Paternity Testing provides conclusive evidence of fatherhood. Our paternity testing lab can answer any of your questions about paternity tests or any other DNA testing questions you may have. Contact us for more information about our paternity testing procedures! Transmetron offers paternity testing for both personal and legal purposes. Paternity tests are available at Transmetron & in some cases, we can also serve customers at their location. Contact your local lab for more information.